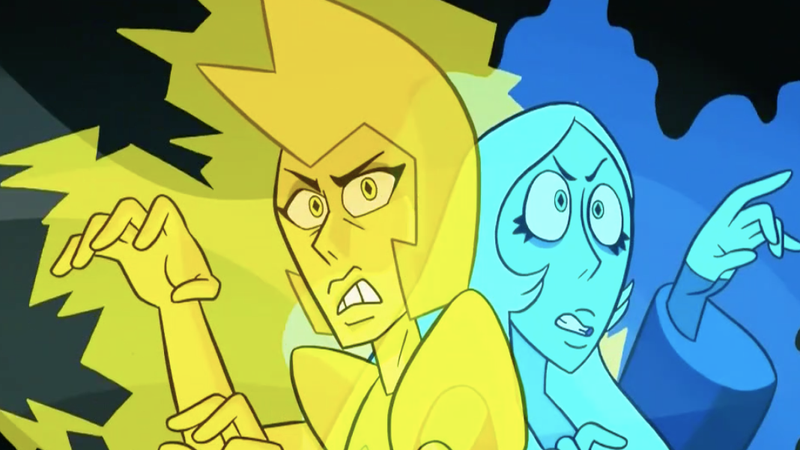 Yellow and Blue Diamond sensing Steven Universe’s presence. There comes a point in every Dragon Ball Z fan’s life when you take stock of all of Goku’s friends and family, and realize that most of them were originally villains hellbent on killing the Saiyan hero before eventually coming to love him. In a lot of ways, the same is true of Steven Universe, a show that’s deeply invested in exploring the idea of love as a transformative force that can bring even bitter enemies together in the right circumstances. Since its very first episode, Steven Universe has always made clear that Steven’s unflappable belief in the fundamental goodness in people’s hearts is the kind of superpower that makes someone strong in real, important way. It’s something that comes naturally to Steven, who’s a generally good kid all around, but it’s also something the Gems encouraged in him as they gradually introduced him to the wider, magical world. Rather than bubbling corrupted Gems simply to keep the Earth safe, Garnet, Amethyst, and Pearl made a point of stressing to Steven that they bubble their former teammates out of a desire to protect them and, perhaps, one day, find a way to heal them. As Steven Universe has shifted away from being a show about a kid hanging out with his queer, alien aunts and focused more on the consequences of his mother Pink Diamond’s actions, its themes about forgiveness and acceptance of have deepened and matured in ways that make it far more thoughtful than many of the other cartoons that inspired the series. With a show like Dragon Ball Z, the formula for a villain’s redemptive arc usually boils down to Goku meeting someone far stronger than him, they fight, they fight some more, and then once all the fighting’s done, the enemy has a drastic change of heart that leads to them becoming friendly. Piccolo, Yamcha, Vegeta—hell, even Majin Buu—they all joined the good guys after the dust settled at the end of their particular, self-contained sagas throughout the series. But rather than tidily wrapping up its answer to those sagas like Peridot and Lapis’ decision to join the Crystal Gems, Steven Universe lets them play out over the course of dozens of episodes that don’t always take place back to back. The Gems spent ages fighting Peridot while trying to keep her from contacting the Diamonds. All the while, Steven insisted that despite all of the trouble Peridot caused, it was worth trying to extend an olive branch and invite her into their unique family. 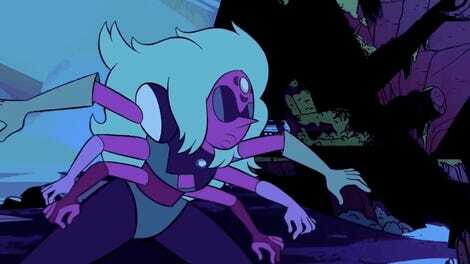 Ultimately, Peridot still ended up narcing on them because that’s the kind of person she was designed to be, but in letting her story play out in a slower, more nuanced, messier way, Steven Universe made her becoming a hero that much more believable, and something you actually rooted for. Even more than accidental leaks, what makes the place Steven Universe is at right now feel a lot like the end is because all of its more complicated characters are coming into the fold and deciding that the Crystal Gems are something they want to be a part of. Last week’s “Heart of the Crystal Gems” isn’t just an epic event with some of the coolest fights the show’s ever had, it’s a testament to Steven’s faith in love and the power of friendship.